Scientists first began to suspect that fossil fuels were contributing to global warming in the mid-1950s. Roger Revelle, a scientist at the Scripps Institution of Oceanography, used the metaphor that humans were using the Earth's atmosphere to carry out a "giant experiment"—one significant enough to potentially alter the Earth's climate. As scientists became interested in studying CO2 and the ways in which it interacts with the atmosphere, the biosphere, the lithosphere, and the oceans, a working atmospheric observatory was set up on the top of Mauna Loa, Hawaii, by the United States Weather Bureau in 1956. Continuous CO2-monitoring was begun. Dr. Charles "Dave" Keeling of the California Institute of Technology also played a significant role in setting up the continuous monitoring program. He felt Mauna Loa was an ideal location for the observatory because it was a natural source of clean air—in the middle of the Pacific Ocean away from sources of pollution. Keeling kept close records year after year of the CO2 levels. He plotted the readings he developed from these records, which resulted in the Keeling Curve, a very distinctive upward trend of CO2 levels from 1958 to the present. The Keeling Curve is considered "the cornerstone of global warming science." In 1997, Keeling was honored at a White House ceremony by Vice President Al Gore with a special achievement award "for forty years of outstanding scientific research associated with monitoring atmospheric carbon dioxide in connection with the Mauna Loa Observatory." In 2002, President George W. Bush selected Keeling to receive the National Medal of Science, the nation's highest award for lifetime achievement in scientific research. Today, the Mauna Loa Observatory is recognized as the world's premier long-term atmospheric monitoring facility and has the distinction of being the site where the continually increasing concentrations of global atmospheric CO2 were first discovered. Here, it was confirmed that the mean atmospheric concentration of CO2 was 316 parts per million by volume (ppmv) in 1958, rose to 369 ppmv by 1998, 379 ppmv by 2005, and has increased every year to the present. By the end of 2007, it had reached 383 ppmv. The Mauna Loa Carbon Dioxide Record is the longest continuous record of atmospheric concentrations of CO2. According to NOAA, it is often called the "most important geophysical record on Earth" and has been instrumental in showing that mankind is indeed changing the composition of the atmosphere through the combustion of fossil fuels. This is what formed the basis for the theory of global atmospheric change through heating of the Earth's atmosphere. Currently, data from the observatory is used by climate scientists and modelers from all around the world to model and predict what the Earth's future climate may be like. Every year, the Mauna Loa Observatory releases new data, which is used by scientists in models, politicians in international plans and agreements, and managers in business, production, and policy making. effect, it is necessary to understand the properties of the Sun's radiation and the way the radiation interacts with the Earth's atmosphere, oceans, land surfaces, and what is on the ground, such as vegetation, lakes, and buildings. It is the Sun's energy that drives the Earth's weather and climate. The Sun radiates enormous amounts of energy throughout space in a wide spectrum of wavelengths, ranging from very short (high energy) to very long (lower energy). This is called the electromagnetic spectrum. Humans can only see a small portion of the electromagnetic spectrum, which is referred to as visible light and can be broken down into the colors of the rainbow, with purple the shortest wavelength to red as the longest, as shown in the illustration on page 17. 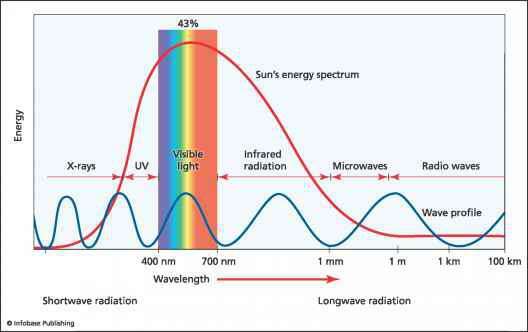 The Sun's electromagnetic spectrum ranges from short wavelengths, such as X-rays, to long wavelengths, such as radio waves. The majority of the Sun's energy is concentrated in the visible and near-visible portion of the spectrum—the wavelengths located between 400 to 700 nanometers (nm). stored, convected, and reradiated. It is because of the special composition of the Earth's atmosphere that the incoming heat energy from the Sun does not just strike the Earth, bounce back off, and get reradiated back into space. The visible light is transformed into heat and reradiates in the form of invisible infrared radiation (the energy changes to longer wavelengths that humans cannot see and becomes heat). Albedo and particulate matter in the atmosphere also affect the incoming solar radiation. Albedo refers to the reflectivity of a surface. A highly reflective surface—such as ice or snow—reflects most of the radiation that strikes it. A surface with a low albedo absorbs most of the radiation. A dark surface has a low albedo, so it absorbs much of the radiation striking it and heats up. When incoming solar energy reaches the Earth, it interacts with the atmosphere and the surface of the Earth in many ways. 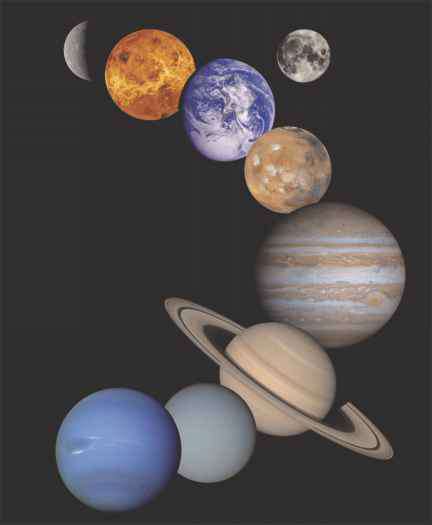 It can be scattered, absorbed, or reflected by clouds, particles in the atmosphere, and the surface of the Earth. The atmosphere can also reradi-ate energy back to the Earth's surface. If there is a lot of small particulate matter—such as dust and smoke—in the atmosphere it can scatter radiation, keeping it from being absorbed. This phenomenon is what creates hazy skies. One situation, called global dimming, happens when there is so much particulate matter in the atmosphere that it screens out incoming radiation, causing a cooling effect. According to scientists at NASA, global dimming may counteract some of the effects of global warming. This means that as humans reduce pollution and its accompanying particulate matter it may actually accelerate global warming. If the atmosphere were transparent and could not retain any heat, then each day the Earth would warm up and at night all the accumulated energy would reradiate back into space and the Earth's temperature would quickly drop below 0°F (-18°C). As noted earlier, less than 1 percent of the Earth's atmosphere is composed of greenhouse gases. 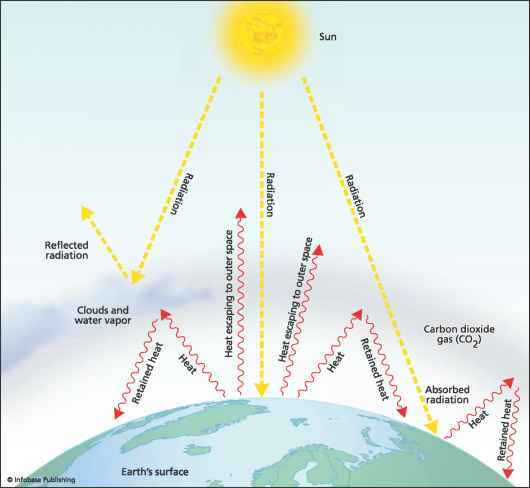 It is these greenhouse gases (water vapor, CO2, methane [CH4], halocarbons [HFCs, CFCs, HCFCs], ozone [O3], and nitrous oxide [N2O]) that absorb the heat radiated from the Earth's surface, trapping the heat and radiating it back to the Earth's surface. This is what is commonly referred to as the greenhouse effect. 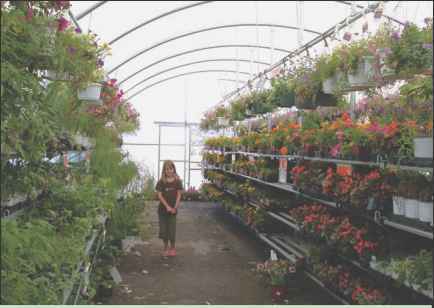 It is likened to a greenhouse because it works in much the same way as a gardener's greenhouse does. In a real greenhouse, the glass panels let in light, which heats the inside and keeps the plants, soil, and interior of the building warmed. The greenhouse traps the heat, keeping it from escaping. That is why the temperature is always much warmer inside a greenhouse. The Earth's atmosphere and its heat-retaining capabilities are critical to life on Earth. Without the greenhouse effect, the Earth would be a very cold planet; its surface temperature would be well below freezing. The greenhouse effect serves to insulate the Earth, creating the mild temperatures that make life possible. When comparing life on Earth to possibilities of life on the neighboring planets of Venus or Mars, some scientists refer to the Earth's greenhouse effect as the Goldilocks principle: It is not too hot, not too cold, but just right. The Earth has a comfortable average surface temperature between the boiling and freezing points of water, and distance from the Sun is only part of the reason why this is so. The rest is due to the composition of the Earth's atmosphere. When Earth is compared to its solar system neighbors, Venus has a thick atmosphere of CO2, making it much too hot to support life—its surface temperature is about 860°F (441°C). Mars, on the other side of the spectrum, has much too thin a layer of CO2 and is too cold to support life—it averages -81°F (-63°C). Changes in the composition of the Earth's atmosphere can alter the greenhouse effect. This has happened naturally throughout the Earth's climate history, with cycles of cooler and warmer periods. Today, however, humans are having a tremendous effect on some of the main elements that determine climate by changing the composition of the atmosphere and changing the Earth's surface. According to the National Academy of Sciences, the Earth's surface temperature has risen by about 1°F (0.6°C) in the past 100 years. Some places have seen a temperature increase of equal to or more than 3.3°F (2°C). Such places include Siberia, which has warmed 3.3°F (2°C) since 1970 (three times the global rate), the Alaskan interior and northern Canada, which have warmed 3.3°F (2°C) since 1950; the Alaskan permafrost areas, which have warmed 4.2°F (2.5°C); and the Arctic Sea. The polar and other high latitude areas are the most susceptible for accelerated temperature rise. The reason for the faster warming in the polar regions is due to the complex feedback mechanisms that exist between the atmosphere, the ocean, and ice. White snow and ice reflect most of the energy coming from the Sun while dark oceans and land absorb this energy. As snow and ice cover melt because of global warming, an increasing amount of energy is absorbed, and the resulting warming becomes self-perpetuating through a positive feedback mechanism. As the system becomes unbalanced, it gets out of control and more difficult for scientists to model and predict. Today, scientists at the Norwegian Polar Institute claim that these processes have been advancing at a faster pace than most researchers have predicted. They state that the warming of the Arctic is much more pronounced than the rest of the Earth's ecosystems. The enhanced greenhouse effect due to human influences has increased the Earth's temperatures since the beginning of the Industrial Revolution, largely through the burning of fossil fuels, industrialization, and deforestation. Greenhouse gases constantly absorb and emit heat energy, so the Earth's surface gets heat from both the Sun and gases. When greenhouse gases absorb some of the outgoing radiation, they reradiate infrared radiation in all directions, increasing temperatures. Any energy trapped between the Earth and atmosphere heats up the Earth. Revolution began, human activities have greatly increased the addition of CO2to the atmosphere. The actual values are alarming. 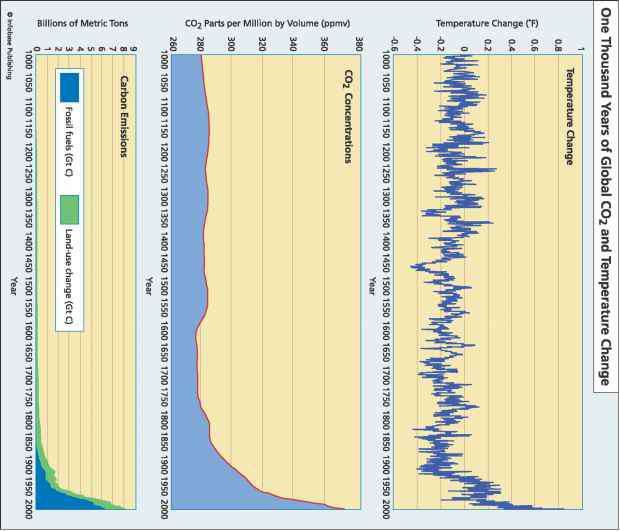 The CO2 concentration in the atmosphere has risen 30 percent since the late 1800s. The preindustrial atmospheric CO2 level was about 270 parts per million; the current level is 370 parts per million. In their 2007 report, the IPCC projects that if humans do not cut back current industrial and lifestyle practices, CO2 concentrations in the atmosphere could reach 600 to 970 parts per million by the year 2100. This means that the average global temperature would probably rise by 2.7 to 10.4°F (1.4-5.8°C) between 1990 and 2100. Another activity that has contributed greatly to the rise in CO2 is the destruction of forests worldwide in order to change use of the land to agriculture, cities, and other human-oriented uses. Forests store huge amounts of CO2 (all vegetation stores CO2), so when forests are removed, so also is the reservoir of CO2. As an illustration, the world's tropical forests hold an enormous amount of carbon. The plants and soil in the Earth's tropical forests hold roughly 507 to 634 billion tons (460-575 billion metric tons) of carbon. Divided, this means that each acre of tropical forest stores about 198 tons (180 metric tons) of carbon. Not only will destroying the forest prevent future CO2 storage, but also if the existing forest is burned, the CO2 that has been stored away for years is suddenly released back into the atmosphere. When a forest is cut down, the carbon that was stored in the tree trunks joins with the oxygen in the atmosphere and produces CO2. This has a tremendous effect on the global carbon cycle. In fact, from 1850 to 1990, deforestation worldwide released 134 billion tons (122 billion metric tons) of carbon into the atmosphere. In comparison, all of the fossil fuels burned each year equal roughly 7 billion tons (6 billion metric tons) per year. Another huge complication for the planet is increasing population size. As increased stress is put on the Earth's resources, as more land is urbanized and more fossil fuels burned, scientists warn that global warming will worsen if positive action is not taken now. Human interaction with the natural greenhouse effect is called the enhanced greenhouse effect, and it is this enhanced greenhouse effect that has earned a negative reputation by those concerned about the health of the environ ment. The table below illustrates global population growth from 1800, projected to the year 2050. Source: United Nations; U.S. Census Bureau, International Programs Center, International Data Base and unpublished tables. Scientists believe these conditions are not natural—humans are contributing to the dramatic changes. If practices are not put in place now to curtail them, the world we leave to future generations will be very different from the world we enjoy today. According to Martin Parry, cochairman of IPCC Working Group II, "For the first time, we are no longer arm-waving with models; this is empirical data, and we can actually measure it. Climatic and environmental changes accelerated by human activity already are under way, and scientists are confident the projected temperature rises will mean significant extinctions around the globe." Dr. Peter Cox, who is a leading climate expert at the Centre for Ecology and Hydrology in Win-frith, Dorset, believes all governments need to listen to what scientists are warning about concerning the future effects of global warming. If humans continue to burn fossil fuels and maintain their other environmentally detrimental actions at the present rates, levels of carbon dioxide in the atmosphere will reach 550 ppm by around 2050. According to Senator John McCain of Arizona, who is the coauthor of a bill mandating stronger action, "the argument about global warming is over." He stresses that humans have contributed largely to the problem and assertive action is needed now. James E. Hansen, renowned global warming expert at NASA, also speaks of human-induced global warming and climate change and warns of the ramifications if human actions are not slowed immediately. He warns that if the present environmental policies continue unchecked, by the year 2100 the Earth will be a completely different planet. Dr. Michael Mann, director of the Earth System Science Center at Pennsylvania State University, is one of the leading authorities on global climate change. His research has been focused on establishing the growing human influence on climate. He cites evidence obtained from instrumental measurements taken from proxies reflecting the past 200 years—a branch of climatology called paleoclimatology. Using past evidence found in tree rings he has been able to positively establish the growing negative human influence on climate. Finally, Dr. Rajendra Pachauri, the chairman of the IPCC, said "The world has already reached the level of dangerous concentrations of carbon dioxide in the atmosphere and there needs to be very deep cuts in the pollution if humanity is to survive." It is going to take the efforts of the global community to work together to stop the global warming that is changing the climate. Massive public education campaigns, responsibility from elected officials, lifestyle changes for everyone, and laws that will be enforced for non-compliers are some of the programs that must be introduced in order to successfully solve the problem. 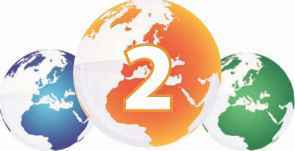 Instead of ignoring the efforts of the United Nations, as has been the norm in the United States, responsible officials and the media should be stressing the IPCC's conclusions. For example, Dr. Rajendra Pachauri, chairman of the IPCC (which in 2007 won the Nobel Peace Prize), has recently suggested (September 2008) that all people should have one meat-free day a week if they want to make an effective sacrifice to tackle climate change. The Union of Concerned Scientists believes global warming is a challenge that every person on Earth can take on and meet, but that action must begin now. Procrastination is not an option anymore. 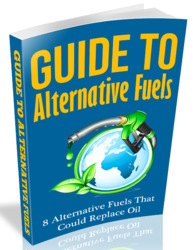 They stress commonsense solutions: fuel-efficient vehicles, renewable energy, and protection of threatened forests. 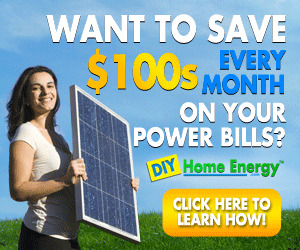 They state that not only will these commonsense solutions reduce global warming, but they also will save people money and create new business opportunities. Best of all, the solutions exist right now. People just need to insist that business and governmental organizations take appropriate steps to ensure that solutions are made both available and affordable to the public. Consumers need to be made aware which choices are best, and those solutions must be made available. How much of mauna loa is below the surface of the water?